For how many things have you called one of the many Professional Plumbers in Phoenix? There are quite a number for systems, within your home that a plumber can work on and many plumbing professionals, such as ours, see quite a few of them all of the time. You know about the leaky faucets and pipes that can cause a big mess. You know that a plumber is the best person for this. But what about a water heater. Who do you call from this if it is leaking or not working? 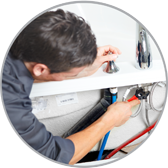 The answer to that question is one of the Professional Plumbers in Phoenix, we have on staff. You also might be interested to know that, of the most serious problems a homeowner can have, a leaking or burst pipe in the basement or crawlspace will really make you wonder about who should you call? Again, the answer is one of our trained, insured and bonded plumbers. It might interest you to know that most of the time when a large pipe bursts in that basement and an impromptu swimming pool is being created, it almost always occurs at night. This makes it harder to get someone to come out, right now, because of this. That is not an issue with us. We know you need the fresh water that is leaking out and you do not want that swimming pool, at least not in the basement. So, you detect a leak or hear a sound that can only be a burst pipe and hear the dog paddling around down there, it is time to give us a call. Our Professional Plumbers in Phoenix arrive, in the middle of the night if that is the time and get the water stopped, the pipe repaired or replaced and start on helping you get rid of the water before it really starts damaging things.